Yesterday evening I set out shortly before sunset to find some new petroglyphs not far from my home. I have been by this site many times before and never knew it was there! 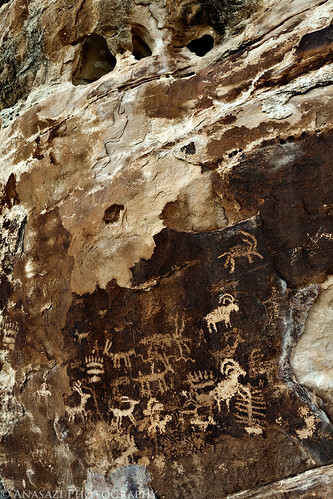 This photo just shows a section of the panel of petroglyphs pecked into a large boulder along the Gunnison River. Like many of the other petroglyphs in the area, these appear to be of Ute origin. So far, this is one of the better panels near my home, and thankfully they haven’t been too vandalized, either.